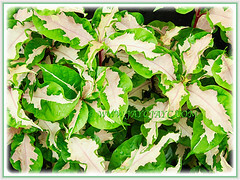 The Caricature Plant is mainly grown for its very attractive and ornamental variegated leaves. They are splotched in mid-green and speckled with cream along the midveins. A popular and versatile perennial shrub with lovely crimson-coloured flowers. Botanical Name: Graptophyllum pictum ‘Aurea Variegata’ (syn. 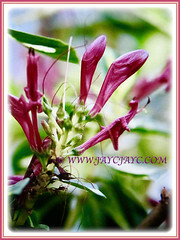 : Graptophyllum hortense, Justicia picta). 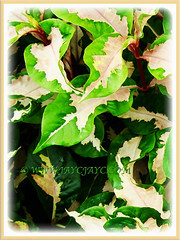 Common Names: Caricature Plant, Jamaican Croton. 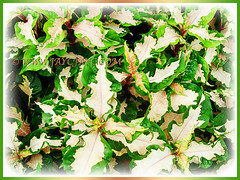 Etymology: The genus name Graptophyllum is derived from the Greek word graptos meaning painted or marked and the Latin word phyllon for leaf, referring to a leaf from the variegated markings on the leaves. The specific epithet pictum originates from the Latin word pictus which means painted or colored and refers to the colourful leaves of this species. 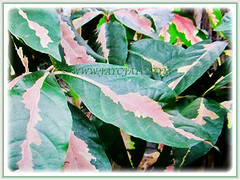 The cultivar name ‘Aurea Variegata’ is derived from the Latin word aureus for golden, referring to the variegated leaves which can be green and yellow. Origin: Native to New Guinea. However, Graptophyllum pictum ‘Aurea Variegata’ is a cultivar. Features: Graptophyllum pictum ‘Aurea Variegata’ is from the genus Graptophyllum that consists of 15 accepted species of flowering plants. This fast-growing species is easy to grow and ideal for hot and humid climates. An evergreen and herbaceous shrub with erect growth habit that can reach 1.5-2.4 m tall and spread 0.6-0.8 m wide. Its 13 cm long leaves are opposite, glossy and elliptic-shaped. They have entire or wavy leaf margin. Leaves are mostly mid-green with a cream-coloured to yellow center that runs along the midvein. Leathery and deeply veined leaves have an uneven leaf texture. It produces showy crimson or pinkish purple flowers that are tubular and located near the stem tips in clusters of 4 cm long and 1 cm wide. 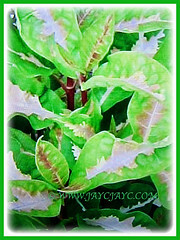 Culture (Care): Graptophyllum pictum ‘Aurea Variegata’ or Jamaican Croton is an easy-growing plant and needs least maintenance. Light: Best in full sun for vibrant foliage colour. It does tolerate partial or full shade. Soil: Humus-enriched, mildly acidic to mildly alkaline, and well drained soils. Soil should be consistently moist but not waterlogged. Others: Prune regularly to stimulate new foliage growth and promote bushiness. This cultivar should be pruned to maintain a compact shape. Apply a complete, balanced fertilizer once a month for outdoor plants and twice a month for potted plants. Generally, it’s free of serious pests and diseases. However, do watch out for caterpillars, mealybugs, spider mites, whiteflies, aphids and scale. 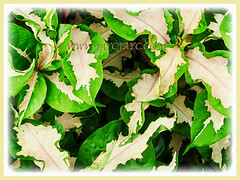 Graptophyllum pictum ‘Aurea Variegata’ or Caricature Plant is winter hardy to zones 10-11 with roots surviving in Zone 9b. Container plants should be overwintered indoors in a bright sun room. Container plants may also be forced into dormancy by cutting back foliage and storing in a dark, cool but frost-free basement or garage for the winter. It really does need wet soil during the summer months or it’ll wilt badly. It will lose all its leaves during light winter freezes but will sprout back quickly. The shrub will flower from early summer to late summer. It is deer and rabbit resistant. Propagation: Propagate by stem cuttings which root easily. Usage: Graptophyllum pictum ‘Aurea Variegata’ or Caricature plant with its vibrant foliage colours will make a bold tropical shrub. It makes a dramatic addition to the landscape. 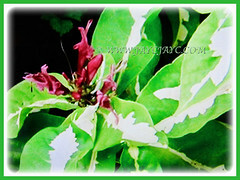 This cultivar is grown for its ornamental and variegated foliage which creates a tropical look. It can be potted in a large container and would grow well on a sunny patio as a specimen planting. 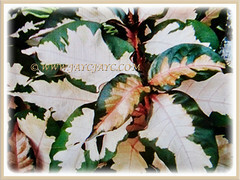 The variegated and slightly wrinkled leaves will provide colour and texture as a border or background planting. It can be pruned into an informal and beautiful hedge or screen. Ideal to be planted at the back of a perennial border or mixed with other shrubs.